Edward de Bono has had faculty appointments at the universities of Oxford, London, Cambridge, and Harvard. He is widely regarded as the leading authority in the direct teaching of thinking as a skill. He originated the concept of lateral thinking and developed formal techniques for deliberate creative thinking. He has written sixty-two books, which have been translated into thirty-seven languages, has made two television series, and there are more than 4,000,000 references to his work on the Internet. 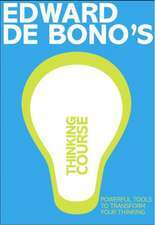 De (autor) Edward De Bono et al.